Astronaut Ricky Arnold isn’t the only piece of Frostburg State that is rendezvousing with the International Space Station this year. A mission patch designed by FSU art and design major Donovan Carter will be on its way to space in June. Carter won the Student Spaceflight Experiments Program Mission Design Competition with his Maryland-inspired patch. 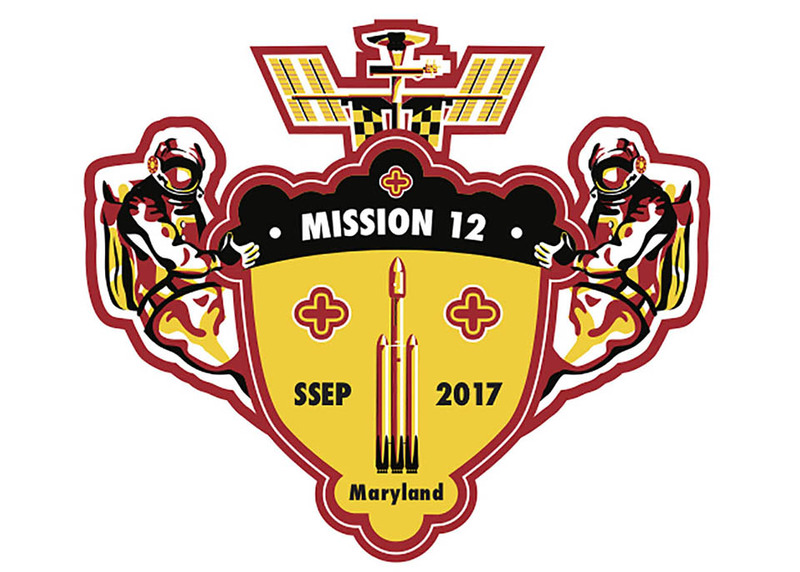 The patch represents the University System of Maryland in SSEP Mission 12. A printout of the patch is expected to lift off on June 9. The mission itself includes several student space experiments that will be delivered to the Space Station, where 1985 FSU graduate Arnold is completing a long-term mission that will have him in space at the same time. For Carter, his own accomplishment didn’t fully hit him until he learned about Arnold’s connection to FSU. Arnold graduated from Frostburg with an accounting degree and later earned his teaching certification from FSU. He is a mission specialist spending his second tour in space, with a mission that includes completing science experiments, STEM lessons and spacewalks. The pride of the Maryland flag is strong, as Arnold has a special jumpsuit emblazoned with the state flag on his chest and a crab-shaped flag on his back. He showed it off during a live downlink with FSU students and 1,200 middle school students that was broadcast on NASA TV. Carter, a Randallstown resident, is proud of his Maryland flag-inspired design. He incorporated the lobes of the crosses bottony around the edges of his patch to form a shield. Throughout, the red and white and black and gold, representing the Crossland and Calvert families, are featured in the design, including the Calvert family coat of arms making up part of the Space Station that sits on top of the shield. “When I started out, I knew I wanted it to be in a badge/shield-like shape but I wanted to make it more Maryland,” Carter said. On each side are hand-drawn astronauts illustrated by Carter that were scanned into a computer and digitized using Adobe Illustrator. 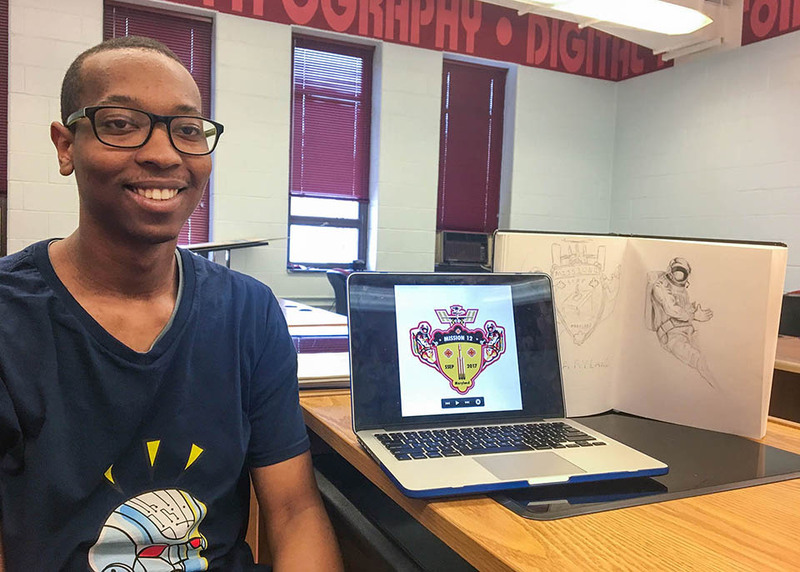 The original design featured a microscope, but Carter’s advanced illustration instructor, Associate Professor Jamison Odone, encouraged him to change it to a rocket. Carter credited Odone’s instruction and encouragement with giving him the skills needed to have a winning design. “If it wasn’t for him, I don’t think I would have won,” said Carter, who also is minoring in art history and graphic design. Carter will receive the patch when it returns to Earth, embossed with a certification showing it went into space. Carter hopes that while Arnold’s still in space, he will get to see his patch and autograph it. “That’ll be the full package,” Carter said. For more information about FSU’s major in art and design, visit www.frostburg.edu/academics/majorminors/bachelor/bachelor-of-fine-arts-in-visual-arts-bfa.php. Donovan Carter poses with his winning space badge design.